"No special effects were involved in the filming of the birds." Winged Migration is a spiritual sequel to 1996's Microcosmos, a French documentary that took a microscope to the world of insects. The new film, from the same producers, does much the same for birds, following a variety of species driven by genetic programming to take flight twice a year and travel unthinkable distances, chasing the changing seasons. Director Jacques Perrin and a team of 17 cinematographers and 450 crewmembers spent four years making this remarkable visual masterpiece, nominated for a Best Documentary Oscar� in 2002. Winged Migration strives for visual splendor over information and education, employing only select subtitles and limited narration to explain what's happening onscreen. I, for one, am glad�any nature documentary (or encyclopedia, for that matter) could bore you with reams of facts about why and how and where birds migrate. This film is more fascinated with the impossible fact that they do, that tiny creatures that weigh less than a pound can fly 2,000 miles twice a year, navigating by instinct and the stars. It might be interesting to know why the albatross spends the first five years of its life circling the South Pole over and over, but I'm suitably impressed that it does, and thankful I can see it in action. And most of the footage is similarly impressive. Bird watching is generally considered a boring sport for boring people, but the intricacies of avian behavior and the sheer variety among their numbers is certainly not boring. Winged Migration captures bird behavior close-up, and transforms it (with the help of Bruno Coulais' music) into a poetic, transcendent spectacle. There are unforgettable images�a flock of penguins cresting the waves; clouds of thousands of birds in flight, shifting and writhing in unison; the peculiar, amusing behavior of the Clark's Grebe, a funny, flat-topped creature that appears to run on the water's surface; the experience of vertigo watching as a crane soars off a cliff in Asia�all humbling displays of nature's wondrous beauty. When the birds fly over man-made factories (one appears to get caught in a pool of oil), it's shocking and disheartening that such elegant creatures must inhabit a world we've so effectively destroyed. Some purists could criticize Perrin for making a "documentary" that is full of fictional narrative elements and tricks of editing (in one shot, birds in a snowy region look tense, and the music swells on the soundtrack as we see them swoop away, seemingly fleeing an impromptu avalanche). Many of the birds were trained movie stars, raised around the sound of plane engines so they wouldn't be distracted during filming. But Perrin admits he was trying to make a sort of visual poem rather than a straight informational piece. His more manipulative segments, including a scene where an injured bird appears to be set upon by predators, serve to illustrate the reality and terrible beauty of nature. Without these manufactured moments, the film would be pretty, but hollow (as they would be rather difficult to capture in reality). Still, the scenes of hunters killing ducks, which are not staged or false in any way, are somehow more heartbreaking. We've traveled with them on their thousand-mile journey, and it really seems a pity for them to be brought down by something as mundane as a hunter's bullet, a small object fired by a small man in a tiny pond, when they've seen so much beauty and lived so freely. Image Transfer Review: This is largely a very nice looking transfer. The footage, though it came from a variety of sources recorded over four years, looks remarkably consistent. Colors are rich, contrast is excellent, and black levels are strong. However, a few scenes show some print damage, and though graininess never distracts, it does seem a bit excessive in a few places. Audio Transfer Review: Winged Migration not only sounds better than 95 percent of documentaries, its sound design trumps many traditional films. The lush score is fully rendered and spread impressively across the front soundstage. The sound effects, all natural recording of bird song, fluttering wings, and whipping wind, make use of all five channels and are incredibly immersing. Very nice. Extras Review: It's rare than an extras package is perfectly suited to a film. There can be too many technical pieces, or too few substantive inclusions, or simply too few supplements in general. But Winged Migration strikes the perfect balance. The generous helping of bonus material answered every question I had about the movie, but never went into minutiae or overkill and never bogged down. And with birds as the only stars, we don't have to sit through tired promo-speak. First is an intelligent commentary by director Jacques Perrin. His thick French accent and sometimes peculiar turns of phrase make it a little slow going at times, but he manages to be informative throughout. He talks a bit about the concept of the project and the difficultly in pulling it off, but he's more concerned with the beauty of the images onscreen. He talks at length about the different species of birds and their behavior, and about the different talented filmmakers who helped him along the way. A 50-minute "making-of" piece is a perfect compliment to the commentary. We follow the step-by-step process of setting up a shot. Even though many of the birds filmed were trained, getting good footage was still largely a matter of chance, and it's fascinating to watch the filmmakers at work. Informative interviews are interspersed throughout, but the majority is given over to on-set footage. Creating the Music is a 15-minute ode to Bruno Coulais' haunting, driving score. He and Perrin discuss their creative process and the gradual progression from ideation to creation to completion. Two Filmmaker Interviews run a combined total of around 25 minutes. About the Film offers more on the creation process from the director and co-directors. Further Insights offers their remembrances of a few select moments and includes footage that didn't make it into the film proper. An animated photo gallery runs 10 minutes and features commentary (in French with English subtitles) about each species of bird featured. Also included are an effective trailer and a clip for the latest bit of acrobatic performance art from Cirque de Soliel. 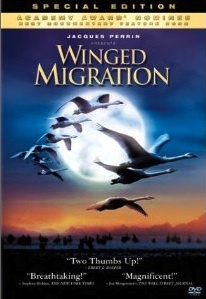 Winged Migration is pure eye candy, a stunning view of nature that eclipses the magic of Hollywood special effects a million times over. It fulfills film's purpose at its core and offers a new perspective on the world, one never before seen by man. The DVD's extras are much appreciated and satisfying, but the film stands on its own.